This past fall, long after the High Holidays had passed, I discovered, hiding under a bag of parsnips in my refrigerator’s vegetable bin, one half of a pomegranate. (Please, no comments about how often I should clean the fridge.) It was still in fairly good condition, but I had no particular desire to eat it and knew that, if left it in the fridge, it would rot. So, I popped the seeds out of their glossy, cream-colored nest and into some fresh potting soil in a clay pot. And waited. 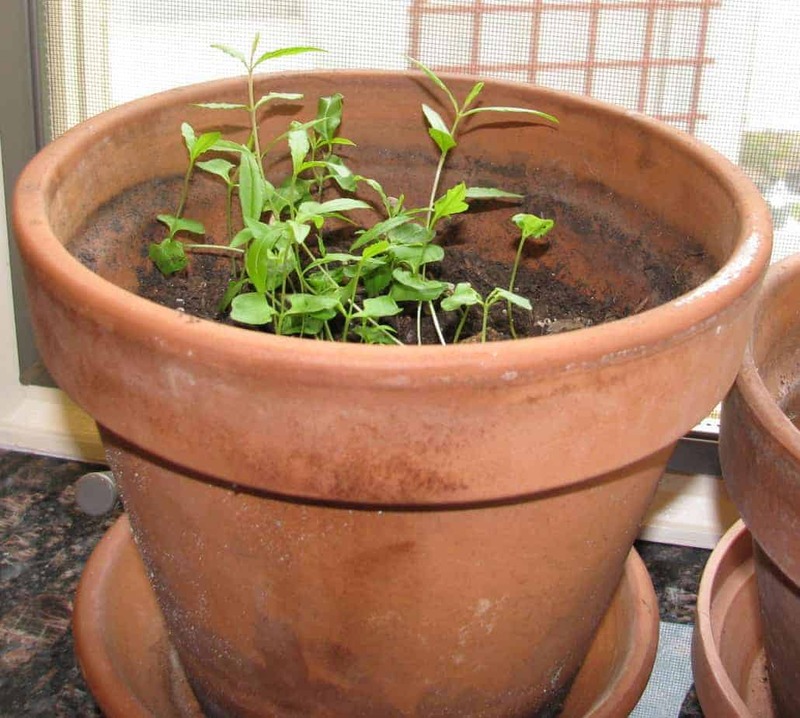 About three weeks later, as I went to the windowsill to water the plants, lo and behold, several tiny green seedlings were popping out of their deep brown home – see photo. I can’t wait to bring the little ones outside this the summer to see how they do. Stay tuned. The pomegranate is just one of the Seven Species – two grains and five fruits – that are named in the biblical book of Deuteronomy (8:8) as being special products of the Land of Israel. The others are wheat, barley, grapes, figs, olives, and dates. So, when one day I was eating an absolutely scrumptious Medjool date, it struck me: Why not plant a biblical garden? After all, I already had the etrog (see previous blog post). So I googled “planting dates at home” and learned that I should place the pits into a glass of water for a week or two before planting, changing the water frequently. The date pits have been sitting in soil for about two months now, but nothing has come of that experiment. Maybe I will try planting without soaking next time. In the meantime, I’ll start reading up on grapes, olives, wheat, and barley. The etrog (citron) is that “fruit of beautiful trees,” one of the four species used at the Jewish festival of Sukkot. The idea popped into my head to scoop out the seeds and plant them. Could they possibly grow? Wouldn’t it be cool to have etrog trees as the, er, genesis of my own little biblical garden? So, I planted the seeds in a single pot. Within a couple months, we had three seedlings. After another few months, it was clear that the time had come to separate the plants into individual pots. I threw out the runt of the litter and repotted the two hardiest seedlings, each at this point about ten inches tall. I then placed them in symmetrically opposed spots in the sunroom, about twelve feet apart. This is where my story takes an unusual, but absolutely true, turn. Within a week, one of the plants had begun to shrivel and turn brown, while the other was still green and healthy. I couldn’t understand. After all, they each got the same amount of sun, water, and attention. So, I brought them both onto the kitchen windowsill where I could keep an eye on my charges. After about a week, the brown and shriveled plant had begun to revive. But it wasn’t just that the sick tree was re-greening. Neither of them was growing toward the sun, as is the habit of every other plant I have ever owned. They were growing toward each other, arching their tender, narrow stems in a manner suggesting that they were whispering in a secret language, reminiscent of twins who had once shared a crib. And, they remained that way for the next year. The etrog trees are now over six feet tall and doing quite well, their leaves emitting a heavenly citrus fragrance. They have grown branches (and sharp thorns!) and have been repotted again. Like siblings, one is beginning to grow taller, while the other is a bit stouter, and both have to be pruned yearly so that their tops don’t scrape the ceiling. They no longer need to stand right next to each other night and day, but I hesitate to move them too far apart. Snooping around the internet, I have learned that it should take about seven or eight years for the trees to produce fruit, if planted from seed. As if teasing me, twice a year for the past two years, creamy white flowers with yellow pistils and stamens have blossomed. While I don’t really expect anything to happen while they sit indoors during the New England winter, I take them outside every summer urging the bees to do their pollination thing. This may just be the year. Stay tuned. There is little as satisfying as preparing a meal with produce that I have grown myself. While I certainly sympathize with the Little Red Hen, and understand why she didn’t want to share her bread with her lazy, good-for-nothing friends, I have a different perspective. I have never asked my family and friends to plant, weed, water, or harvest, so there is no reason to deny them the pleasure of partaking in a salad made from freshly-picked veggies. Or a sage-infused sweet potato gnocchi. Or a tabouli made fragrant with mint and parsley. So, back in October, when daughter, Elana, and her fiancé, Adam, surprised me by building a cold frame in the backyard, I was thrilled. I had read up on cold frames – basically, mini-greenhouses — and fantasized about having fresh, homegrown vegetables during the darkest, coldest days of winter. Now, my dream was about to come true. Of course, the very next day was the Halloween that witnessed a historic, freak snowstorm. I was convinced that this season we would, as in the year before, experience record snowfalls and low temperatures, and that my dream of having a winter garden would be dashed. However, the snow melted in a matter of days, and I transplanted the parsley from my summer garden, saying a little prayer while patting the soil around the bunch. After the kids departed for Chicago, I did some more reading. One source told me that in some parts of Europe it is traditional to plant seeds in cold frames on the shortest day of the year, so I planted lettuce and radish seeds on December 22, the solstice in Great Britain, and drank a cup of tea in solidarity (and to warm up – it was cold outside). Little did I know that the winter of 2011-2012 would be another type of record breaker. It was the warmest on record, with the least amount of snowfall ever. But it was, in fact, still winter so I didn’t really expect much to grow. Imagine my surprise when, after a couple of weeks, the seeds began to sprout. And they actually grew, albeit slowly. The enterprise was not without its bumps. Remember that old science lesson about setting fire to a piece of paper by putting it under a magnifying glass in the sun? Well, in mid-March, local meteorologists predicted two days of temperatures in the 80s, and guess who forgot to take the glass cover off the cold frame? I now have some green lettuce leaves with crispy brown tops. Luckily, that didn’t stop the rest of the crop from flourishing, and we should be enjoying salad in about two weeks. And, here it is April and I am still harvesting parsley from last summer’s plant. Won’t it be neat to showcase it, and the lettuce, on the seder plate this weekend? I have to admit that I had worried about becoming blasé at having access to homegrown vegetables and herbs all year. So far, no problem; the joy is still there. To see green sprouting in the midst of gray, barren trees and hoar frost-covered lawn was both comforting and inspiring. Next year, when a real New England winter is sure to rear its cold and snowy head, the green will be even more rousing. I have already begun fantasizing about erecting one of those pop-up greenhouses. How big a unit can I fit into the backyard? I wonder if I can get oranges to grow? How long can I go between visits to the supermarket produce department? Will my husband have me committed?